A Reuben Sandwich is sweet, salty, rich, and tangy – it is every good thing a sandwich should be and you’ll LOVE our Reuben recipe! 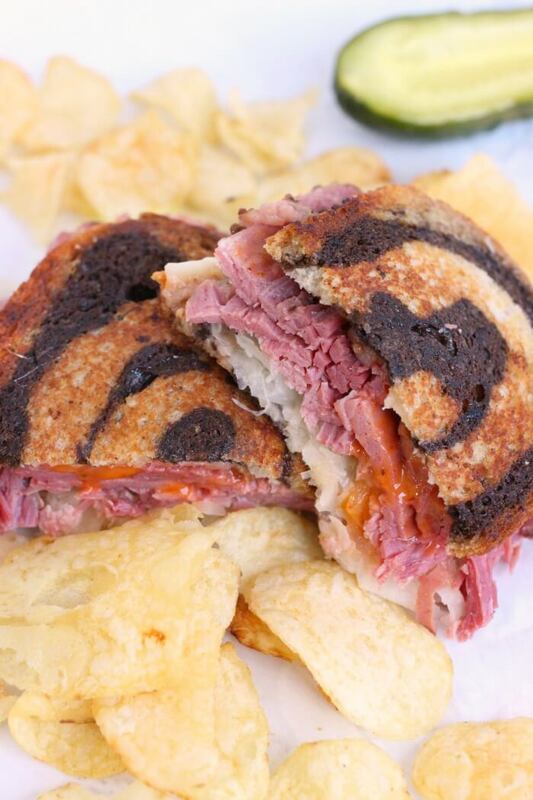 Reuben Sandwich – just thinking about it makes me salivate. Having a good Reuben Sandwich recipe is a must when you want to have friends over and give them a little “wow” factor for lunch! 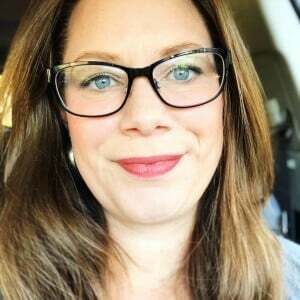 And lucky for you, I am going to show you how to make a Reuben Sandwich that will knock your socks off! Grab some corned beef from the deli or use leftovers from your corned beef and cabbage! Serve it up with cabbage soup to keep it simple. And after the richness and saltiness of a Reuben, a slightly decadent dessert, like chocolate mug cake, really rounds it out. Or go full Irish with a Shamrock Shake! Marbled Rye Bread – We’re keeping this authentic, folks. Marbled rye (or classic rye) for the win! Corned Beef – Thin sliced and piled high. We like to use leftover corned beef from our corned beef and cabbage! 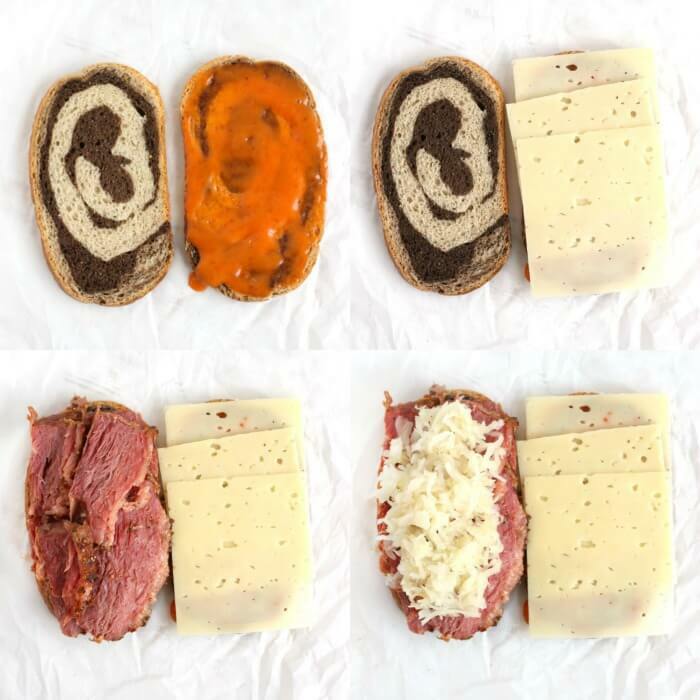 Swiss Cheese – Swiss adds a perfect sweet balance to the saltiness of cured and pickled corned beef! Sauerkraut – Sauerkraut is fermented cabbage, it adds a vinegary acidic tang to the reuben sandwich. You can make your own or purchase a jar at your local grocery store. Russian Dressing – Nope, can’t substitute and still keep it real. But if you must, you could use Thousand Island Dressing, they are similar in flavor. Butter – For grilling, and for flavor. 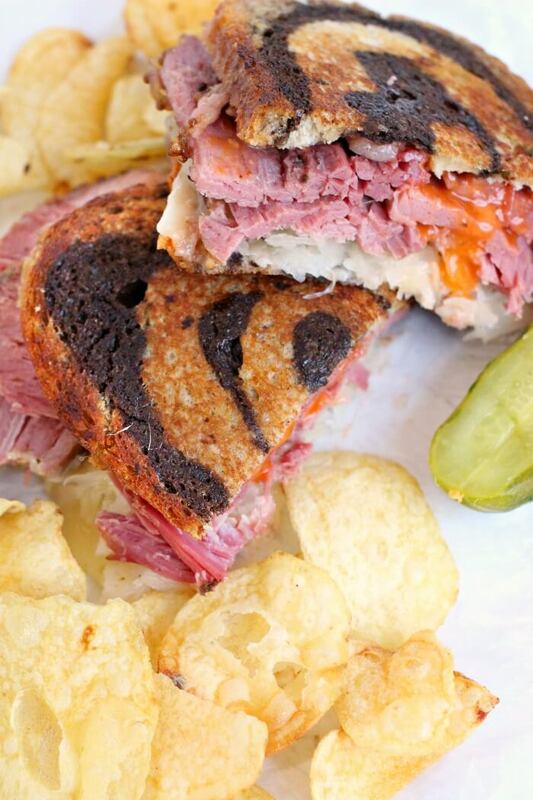 A traditional Reuben Sandwich is toasted in butter like a grilled cheese sandwich. First, layer sandwich in the following order: slice of rye bread, a slice of Swiss cheese (or three), corned beef, sauerkraut, Russian dressing, and bread again. Next, melt butter into a skillet on medium heat. Then, cook sandwiches in skillet until both sides are golden brown and cheese is melted (flip the sandwich carefully with a large spatula). Finally, cut into halves onto serving plate and wait for the accolades to pour in! ★ If you don’t have sauerkraut try some leftover cabbage from your corned beef and cabbage or from your cabbage steaks, and give them a good squeeze of lemon juice or a dash of vinegar first. ★ Thousand Island dressing can be substituted for the Russian dressing if you prefer a sweeter flavor, or if you can’t find Russian dressing. ★ We love our sandwiches on marbled rye, but traditional rye bread is delicious too. Depending on where in the world you are, if you like caraway seeds in your rye bread, you’ll want to look for bread labeled “kimmel”. 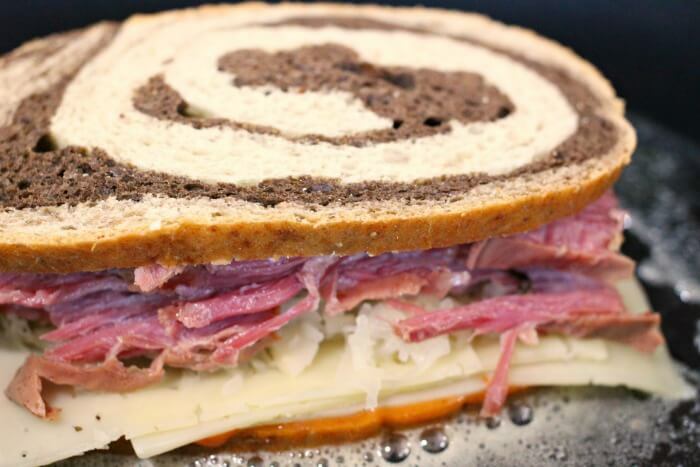 Reuben Sandwiches originated with a Jewish-Lithuanian grocer in Omaha Nebraska named ReubenKulakofsky, who created the sandwich for his friends in a weekly poker game. The game was held at a local hotel, The Blackstone, and the owner eventually put the sandwich on the hotel’s lunch menu. 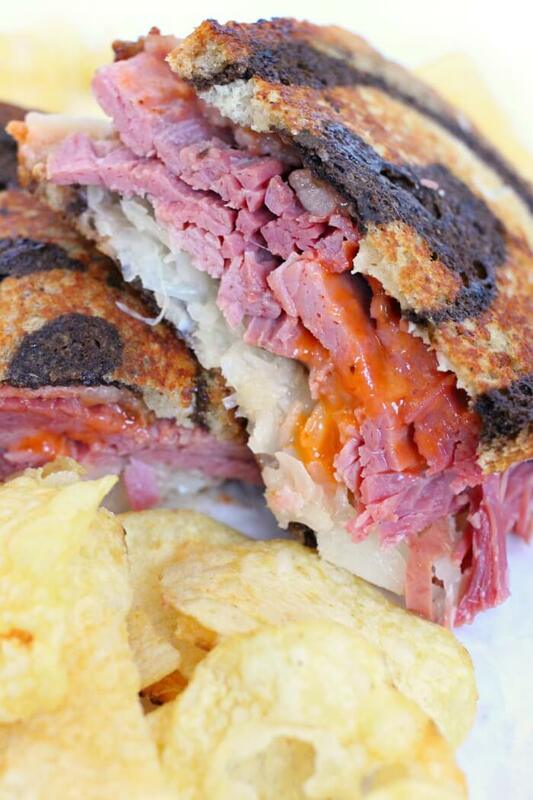 A Reuben Sandwich is made with corned beef, as it’s meat of choice. 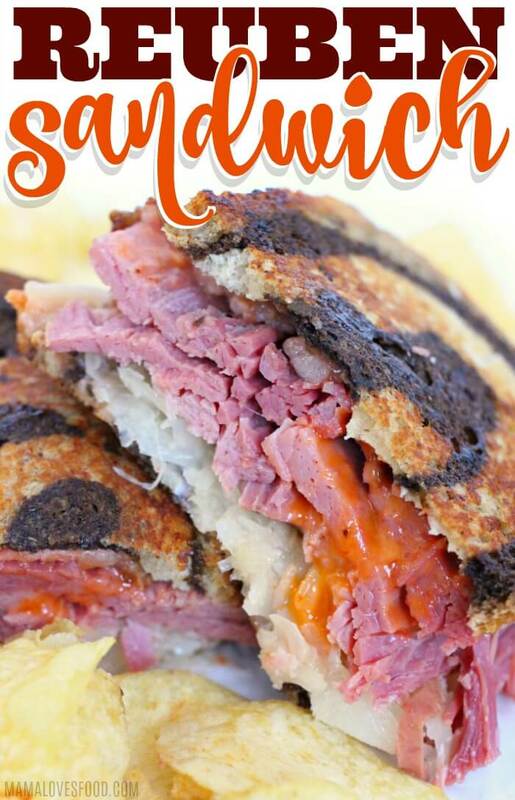 There is a variation called the Rachel Sandwich which substitutes pastrami or turkey for the corned beef and coleslaw for the sauerkraut. 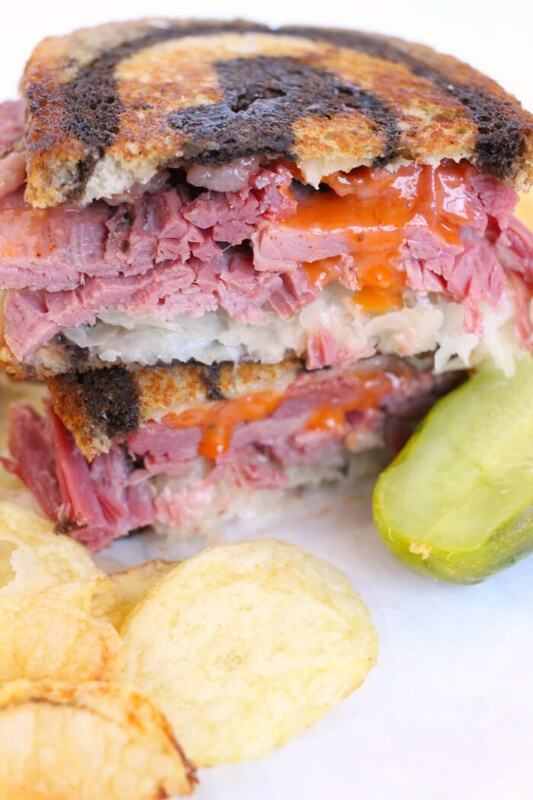 The biggest difference between pastrami and corned beef is that pastrami is smoked after curing, and pastrami is cured with a dry rub while corned beef is cured with a brine. The difference between Russian Dressing and Thousand Island Dressing is in the preparation. Russian Dressing is less sweet and is usually made with mayonnaise, chili sauce or ketchup, relish, horseradish, paprika and other seasonings. Thousand Island Dressing often has a sweet pickle relish and lemon or orange juice and a couple of other changes. So the two dressings are not interchangeable, but some restaurants will substitute Thousand Island Dressing instead of making it’s less sweet cousin for ease of preparation. A Reuben sandwich tastes like a rich salty deli sandwich. 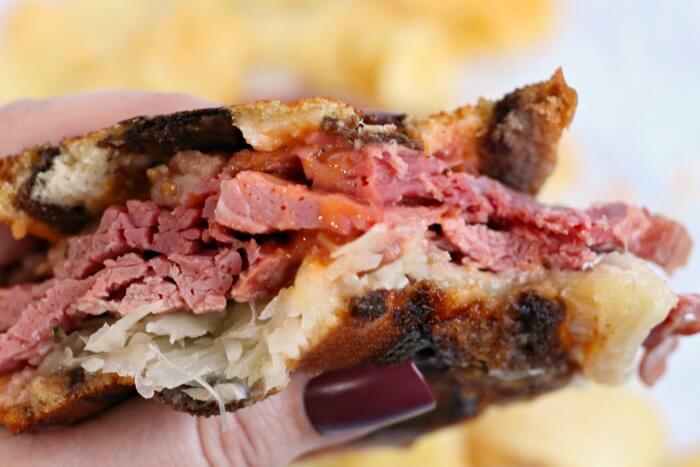 It tastes salty and fatty from the corned beef, rich and savory from the Russian dressing, sweet from the Swiss cheese, and tangy from the sauerkraut. The pan toasted bread gives it a beautiful crunch to contrast the soft interior. It really is the pinnacle of flavor and texture combinations! A Reuben Sandwich is not really considered a “healthy” food, but you can make some substitutions to help it fit into your healthy diet. In order to lower the amount of saturated fats and sodium, the two items that tend to worry folks, you can lower the amount of meat and cheese to start. Thinly sliced or lower calorie rye bread is also an option, as well as reduced calorie dressing (or just using less of the original dressing). Good news, though! You can have pretty much all the sauerkraut you want! The calories in a Reuben Sandwich will vary, especially in a home made version versus a restaurant version. The homemade version will probably weigh in at around 600 calories, but obviously will depend on the portion sizes you use! A restaurant version can easily top 800 calories due to the high amount of meat and dressing they typically add. You can prepare your Reuben Sandwich ahead of time and freeze, but you would want to leave the sauerkraut off and add once reheated, as it may not freeze well. Before reheating, allow sandwich to thaw in the refrigerator. Reheating a Reuben Sandwich is best done in an oven or toaster oven, as microwaved sandwiches tend to get soggy. If you have leftovers (and you might! A Reuben is a very hearty sandwich) wrap the sandwich in aluminum foil and place on a roaster tray in a preheated 325F oven for 15-20 minutes. A Reuben Sandwich is not kosher, as it combines meat and cheese. 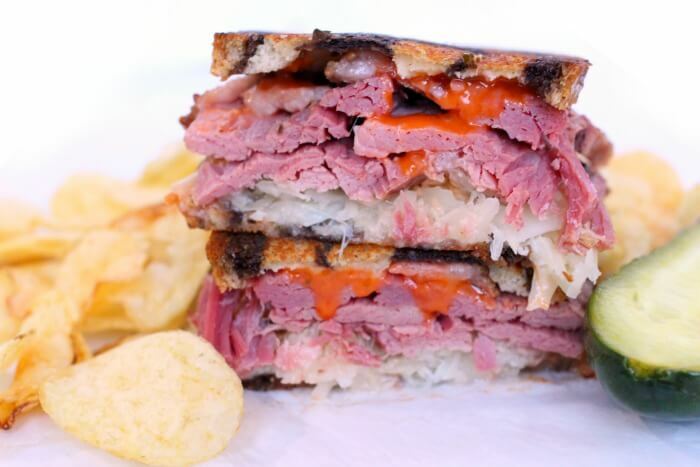 Some kosher delis will serve the sandwich without the cheese in order to keep it kosher. 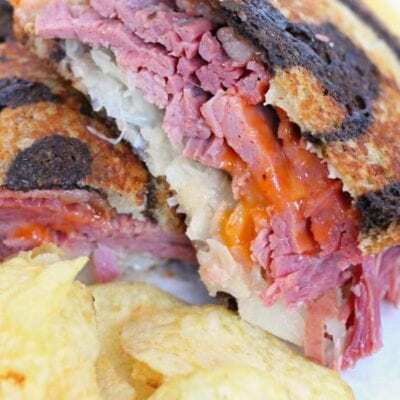 A Reuben Sandwich is safe to eat during pregnancy, as the corned beef is cooked (if you’re purchasing deli sliced corned beef, you will want to heat this to steaming). However, always check with your medical provider if you have any questions during your pregnancy – nothing here should be construed as medical advice. 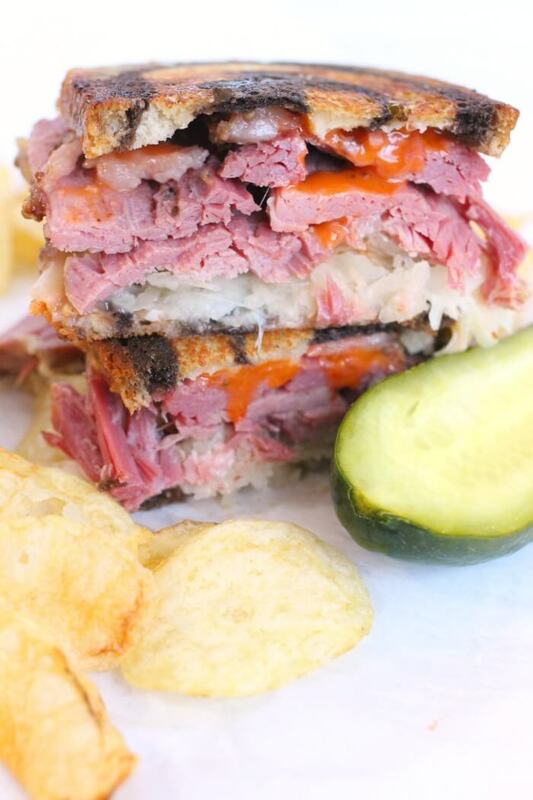 A Reuben Sandwich is typically served with a dill pickle and chips if ordered at a deli. We suggest doing the same at home with our refrigerator pickles and a bag of chips, or if you have time, make some potatoes wedges. This sandwich absolutely does not disappoint! Amazing! Such a satisfying sandwich, and hearty enough for dinner! My whole family loved it.